September 2005 saw the beginning of our catering system when we decided that we wanted to provide our pupils with good, balanced meals using locally sourced produce. The Governing Body Finance Committee oversees finances, menus and resources. 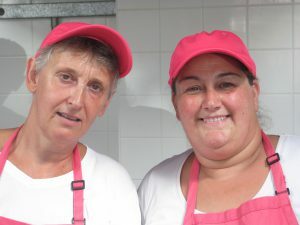 Our own resident cook, who lives locally, knows all the providers and takes into account childrens likes and dislikes. About two thirds of our pupils now regularly have school lunch and can be seen checking the three week menu to see what is on offer. Some pupils opt-in on special days when we have a celebration meal such as Harvest, Christmas, Easter and sporting occasions. The tables are then decorated to make the occasions more festive. Each term parents are invited to dine with their children during a special invitation week. A number of parents take the opportunity to join in and one dad was heard to ask if he could come every day! We are really pleased with the impact providing in house lunches has had and long may it continue. The school has been awarded 5 stars by Ashford Borough Council for Kitchen Hygiene.